The construction method used to assemble the first phase of seafloor crustal plates on spherical models is very simple and very basic. Each coloured seafloor stripe previously shown on the sinusoidal map is simply removed in turn and the remaining map fragments are reassembled by cutting and pasting onto a pre-determined smaller radius Earth model–determined by measuring the surface areas of each coloured stripe and from this calculating the ancient Earth radius. This, in effect, can be likened to a spherical jigsaw puzzle where the pieces of plates cut from each of the 24 map segments are reassembled together on a sphere. Spherical small Earth models of a Jurassic to present-day Expansion Tectonic Earth showing modelled seafloor crusts. Each small Earth model demonstrates that the seafloor crustal plate assemblage coincides fully with seafloor spreading and geological data and accords with the derived ancient Earth radii. For each model constructed, as the younger coloured seafloor crustal stripes are progressively removed, the remaining plate boundaries are then reassembled along their common mid-ocean-ridge spreading axes on a reduced radius small Earth model. Of interest is that, on an Expansion Tectonic Earth, the mid-ocean-ridge spreading axes do not move. They instead retain their global integrity throughout time. It is the configuration and location of the mid-ocean-ridges that dictates precisely the assemblage of each adjoining crustal plate boundary. 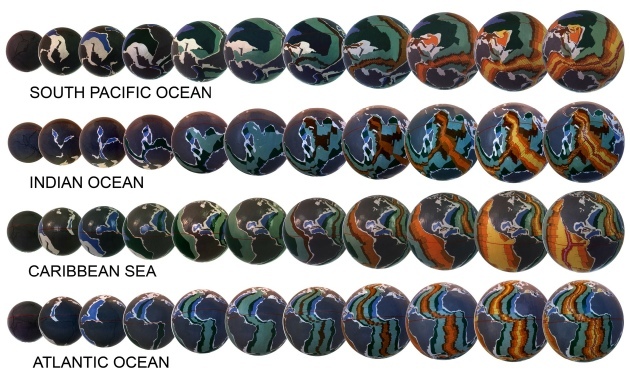 For the completed small Earth models shown above, as the coloured seafloor stripes are removed in turn it can be seen that the remaining coloured stripes neatly close together on each successive model. Each crustal plate assembles together in a unique, orderly, and predictable manner, during systematic closure of all of the oceans. By removing the coloured seafloor stripes in succession and refitting the plates together on smaller radius Earth models, each plate is then shown to reunite precisely along their respective mid-ocean-ridge spreading axes, estimated to be at better than 99 percent fit-together for each model. The remaining one percent misfit is simply a combination of map error, cartographic discrepancies, as well as the influence of unaccounted crustal distortion or graphical limitations inherited during model making. This unique fit-together of all seafloor crusal plates empirically demonstrates that post-Triassic Expansion Tectonic small Earth models are indeed viable and therefore justifies extending continental crustal modelling studies back further to the beginning of geological time.